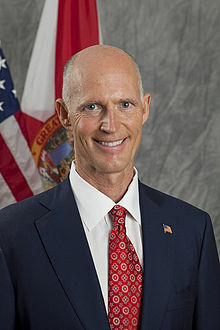 TALLAHASSEE, Florida -- Florida Governor Rick Scott has denied a behind-the-scenes deal that would have brought an Amazon.com distribution warehouse to Florida where Amazon would have been given a break on Florida sales taxes until after the 2013 Christmas shopping season, the Associated Press reported. The Governor's rejection of the deal is in stark contrast to the millions of Florida tax dollars given to companies to relocate in the Sunshine State such as the recent Northrop Grumman deal in Brevard County, Florida. Just last week, Governor Scott appeared on CNBC to tout that Hertz was moving its headquarters to Florida at a cost to taxpayers of around $19 million for 700 jobs. During the same segment in the video below, Scott was repeatedly asked about the internet tax because the interviewers were unclear about his position after his responses to their questioning.